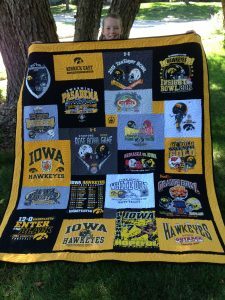 Campus T-shirt Quilts by Cindy Swanson is located in Clive, IA. March is slipping away! YES, there is time to have a t-shirt quilt completed for this year’s graduation. Do you have a high school or college, graduating senior in your family for 2019? Ship or drop off your shirts to me! Your t-shirts and a $100 deposit will get your project on my quilting schedule. Graduation is coming quickly. As of today’s schedule I estimate availability for a couple more quilts before caps and gowns are worn across the stage. So share with your friends! I look forward to creating a wonderful keepsake for you and your family! Here is the CTSQ Order Form with “next step” instructions in the lower right side. Ship them to my address. If you’re local you can drop your shirts off at my front door or schedule a time to meet with me. Contact me with questions! 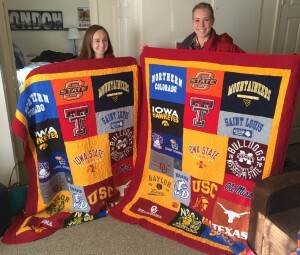 Campus T-shirt quilts were the topic of KCCI’s news story on Campus T Shirt Quilts. It’s very exciting that KCCI in Des Moines, Iowa, featured CTSQ on early morning news! 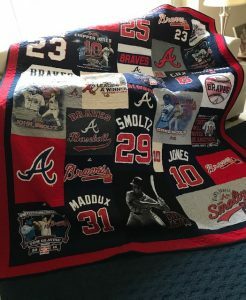 Cindy Swanson is an expert at making perfectly designed t shirt quilts. Colors are balanced by Cindy and she’ll pay attention to details, too. 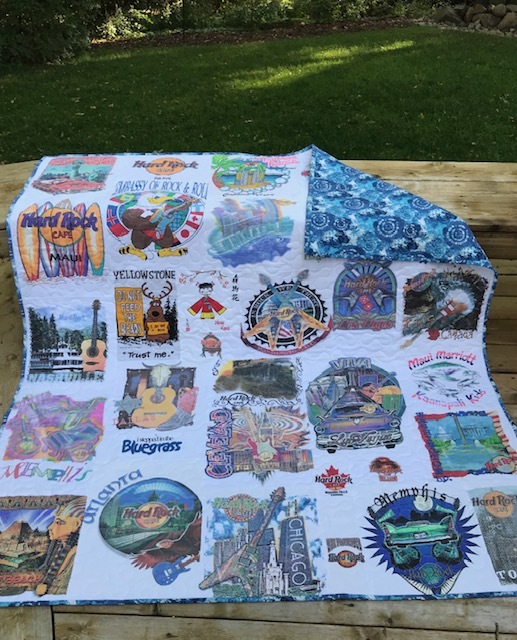 As a result, your t shirts will look great in a quilt even if they are well loved and worn out! Make this a gift for yourself from saved sorority t-shirts, running shirts from races, vacation locations, or send in your graduating high school or college senior’s shirts to make a great gift for your special graduate. Cindy will transform your treasured t shirts into a great T-shirt quilt, guaranteed! NEW MEMORY QUILTS! We can make a memory quilt from ties, dress shirts, jeans and more. CTSQ make fabulous t-shirt quilts from YOUR t-shirts! Since 2009, Campus T-Shirt Quilts have been sewn together with care. Cindy designs them to be great mosaic t shirt quilts, and memory t shirt quilts for you to keep forever. Especially relevant is the fact Cindy never irons stiff interfacing on the back of t-shirts. 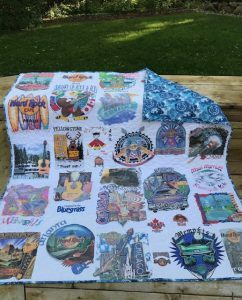 As a result, customer’s t-shirt quilts will be soft and perfect for relaxing on the couch. You’ll use your new quilt for picnicking, tailgating, dorm room bed or futon, or even tent making over a card table with the grand kids. Your friends and family will also love hearing the stories associated with your t shirts! All fifty states visited and District of Columbia, too! Have a Campus T-shirt Quilt made from your favorite, team t-shirts. 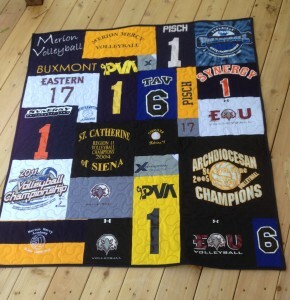 Campus T-shirt Quilts’ photo gallery will show you a great variety of cherished projects! Visualize your own T-shirts sewn together in a powerfully, memorable way. 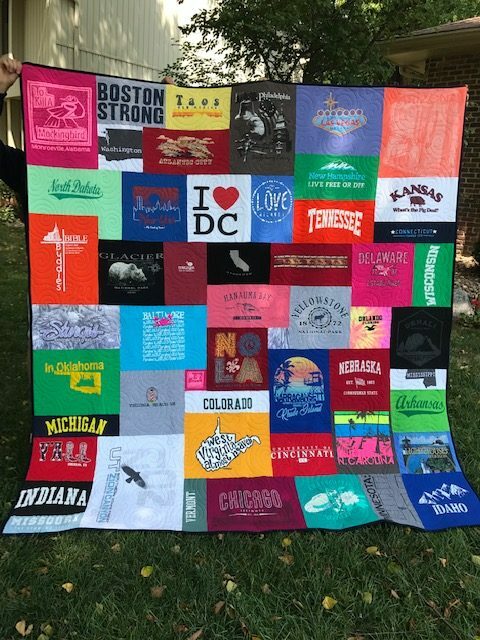 What kind of t-shirt quilt would you like created? Maybe you’ll like a movie t-shirt quilt, Harley Davidson t-shirt quilt, Army t-shirt quilt, or sorority t-shirt quilt from treasured and saved T-shirts in your closet? You’d surely like to have a warm and cozy t-shirt quilt rather than drawers and closets full of t shirts that are too special to throw away. Also, your t-shirt quilt will get so many memories in the same place. Visit CTSQ’s order tab for more information. Most noteworthy, it only takes as little as one week’s time (usual time frame is 6 weeks) before you’ll have your dream, t-shirt quilt! While you wait, Campus T-shirt Quilts will be creating your masterpiece! CTSQ wants to hear from you! Please contact us if you have any questions or want to be sure there is a real person behind this URL!